Photography has been a part of humans’ life since the dawn of photography’s existence. Photos can capture every unforgettable moment of life either happy, surprise, sad, angry or frightened times. Yet, not all the pictures come out nicely. It requires techniques, skills and creativity of the photographer to create a clean and clear picture. Equipment is an essential ingredient in this work of photography. Beside from camera that is the main tool, a professional photographer is also demanded to have a softbox lighting kit in hand. A softbox light will be the external support of light when the natural light is not enough. 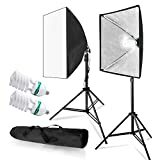 Through this article, you will get to know the detailed information of the top ten softbox lights from different brands that are the hot trends in 2019. The first softbox light of this list is the product of ESDDI. This softbox light can soften and smoothen the light wave during the shooting. It also can fill in the shadow area of the shooting location with enough lighting. The silver interior face is designed with specific angle to reduce the light loss as much as possible and ensure the widespread of the light during the shooting. The 110V CFL light bulb in the middle consumes only 85 watts of energy, yet the brightness of light is almost the same as the 800-watt normal light bulb. It has the operating temperature so low that can save energy up to 80%. The light stand is made of aluminum alloy that is light but strong and stable. The height of the lighting can be adjusted between 26 to 78 inches. With the warranty of 180 days, you do not have to worry about the malfunction. Experience the ESDDI softbox light now to feel like a professional. This softbox light from MOUNTDOG is actually one of the handy photography kits. The 135W light bulb of this softbox light is the perfect light bulb for the studio or indoor photography. It has not one but two extra light bulbs making a total of three light bulbs within a lighting kits. Thanks to the E27 socket attached with this softbox, the generated light comes out in soft and even pattern. The light stand can be raised up to 80 inches and the angle of the light can be adjusted up to 210° perfect for any effect from any angle. Many customers said that this softbox lighting kit is so convenient to set up and ready to use. The quality of the picture after using this softbox light very much satisfies them. This softbox light has the warranty of 1 year that you can return or refund back if not enjoy using it. We hope you would not let this MOUNTDOG softbox light pass away. 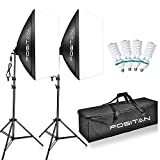 Up next is the FOSITAN softbox light that has caught the attention of many photographers. To save time during the shooting time, this softbox light has provided two spare light bulbs over the original light bulb. The most interesting part is that each of these 85W CFL light bulbs can work on brightness like the normal light bulb that consumes roughly 1600 watts. It produces a high quality of light yet saves a lot of energy. The aluminum alloy-made lighting stand is designed to fold and carry easily since it is light in weight. The silver shade is made of a high quality fabric that ensures enough lighting and soften the harsh light. Because of that, this softbox light has been used for various purposes either product shooting, wedding photoshoot or editorial photography. It also has the night-mode setting and the daylight support function. We guarantee that this FOSITAN softbox light will make your shooting go smoothly. If you are looking for a compact softbox light, Safstar softbox light is the right choice for you. This softbox is only 24 x 16 inches which is smaller than any other standard softbox. However, the capacity of its light is as strong as other softbox light. It can function to give enough light for shooting and eliminate any shadow or harsh light. Because of its compactness, its stand can be made to extend up until 90 inches which is higher than standard light stand. With this high stand, the shooting process can capture further space as the light can reach higher and further. Its lighting stand is made of premium aluminum that has a great quality for the equipment that requires to move from place to place. It is ideal for the photoshoot of product advertisement or art photography. The carry bag for this softbox is small enough to carry around as softbox and light stand can be foldable. Le’st not wait any longer and enjoy the Safstar softbox light now. Another choice to choose is the softbox light by CRAPHY. The design of this softbox light is made to ease the process of setting up this kit. The system of opening and closing the umbrella this softbox is pretty easy by just pressing down on. It is quick and ready to use on time. The diffused light comes out with a great softness that is perfect light modifier in the studio. The front curtain can be attached or detached according to your preference. The 135w light bulb balances the pure white light which up to 80% of energy can be saved. Its light stand is well made from aluminum alloy that is strong and stable to hold in place. The reviews from customers have mentioned about the high quality of light and material and the easy-to-assemble process. Grab the CRAPHY softbox light now to experience the great quality of light and picture. Julius Studio has introduced us the new model of the softbox lighting kit. 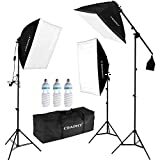 Within a carry bag of this softbox lighting kit, there are 20 x 28 inches of softbox, 85w light bulb and light stand which comes in 2 pieces each. The bulb socket attached with the softbox is the standard E27 socket for light bulb. The lighting bulb is an eco-friendly product that it can save 80% of electric energy. The softbox also has the cable cord for plug-in that is as long as 6 feet, which it can move further from the electricity source. This softbox light has the daylight setting that can adjust to different light level for different place. The carry bag itself is made from a premium fabric that has high quality to withstand any stress or rough use. No more worry about the quality of light and lighting skit with Julius Studio softbox light. Another epic piece of photography kit to look at next is the Neewer softbox light. The light bulb of this softbox light is the type of 85W CFL bulb which is the new technology of the light bulb. It can operate in a low temperature and does not produce much heat to the light bulb unlike other type of normal light bulb. Because of this, the lifespan of this softbox light tends to last longer and it saves a lot of money on the maintenance. Beside from light bulb, the E27 socket come with this softbox can be used directly with fluorescent tube or slave flash as well. Aluminum alloy-made light stand has given it an extraordinary strength to support the load of the softbox. The height of light stand can extend up to 224 centimeters a bit higher than normal softbox light stand. 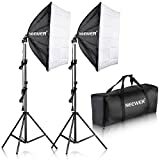 You should consider getting the Neewer softbox lighting kit now. The LimiStudio has introduced the softbox light made from high quality materials. The unique point of this softbox light is the light stand itself. It can be extended up to 86 inches which is higher than other brands of softbox light. Because of this height, the light support during the shoot can reach wider area making the quality of the image incredible. The angle of the softbox head can be adjusted up to 270° wider than many other softbox head. The light bulb is the type of spiral-shaped fluorescent light bulb that can save energy up to 80%. It uses only 85 watts of power to function like the normal light bulb that consumes 350 watts. For the light diffuser, it is made of premium nylon that can guarantee the maximum amount of light reflection and also have 2 level of light setting. We guarantee that the LimoStudio softbox light will provide you the unforgettable shooting moment and the high quality of image. Are you looking for the softbox light for video shooting? The Fovitec has come up the softbox lighting kit for those who want to shooting the video. 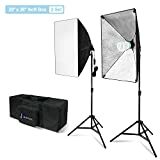 This 20 x 28 inches softbox light has the maximum extended height of 7 feet and 6 inches which is the appropriate height for the video shooting. The light can reach far enough for the camera to capture in the video motion. The lighting control panel in the softbox head itself can be switched to use the desired light bulb during the shooting. The socket head can insert up to 5 light bulbs at a time which makes the lighting even brighter. With 5 CFL light bulbs used, the quality of lighting is equal to the normal light bulb with 2000 watts. Many customers have enjoyed using this softbox light for video shooting and even streaming. Enjoy your high quality of video shooting with Fovitec softbox light now. Another softbox light for video shooting is also from the MOUNTDOG. The light of this softbox light is extra special and different from other brands. It is made specifically for video shooting. 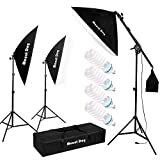 The light bulb of this softbox is not 45w or 85w like previous softbox but it uses 1350 watts of power that can generate a much brighter light compared to other softbox. However, it is guaranteed that the light will not bother or affect your eyes. 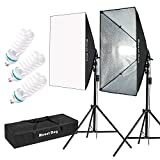 It has been used to shoot video that requires strong and bright light and many YouTuber have recommended this type of softbox light. 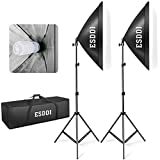 This softbox lighting kit also comes with 3 extra light bulb to spare which many customers find it handy in time of emergency. Just like the previous model by MOUNTDOG, this model also has the warranty of 1 year as well. You can return or refund at any time you want within the first year. Get the top grade of MOUNTDOG softbox light for your video now. All in all, these softbox light mentioned below have distinctive features and to different places. Some are for indoor or outdoor photoshoot, while other are for portrait or video shooting. It depends on the photographer to choose the one that fit their demand and preferential. We hope you find this article useful for your choice of softbox light. We know that some customers still have questions regarding the criteria for choosing the perfect softbox light that matches their personality and professionalism. Therefore, we have written down the aspects needed to take into consideration when wanting to buy the softbox light. Let’s check them out below. Easy to setup: The softbox light should be easy to setup because it has to be moved around from place to place frequently. When needed to use, all parts of equipment should be ready to use by just unfolding and reassembling. It should require the user to plug in the electricity cord and everything is done. Size and height: Different place or location might need the softbox light to have different heights and sizes as well. In a small space, short and compact softbox light might be suitable and same goes to the larger place. However, it would be better to get a softbox that can extend the higher the better because it can be adjusted down if needed anyway. Power consumption: Typically, the higher energy the light bulb consumes, the brighter the light is. However, we need to reduce the consumption of power by those softbox light to save energy and money as well. The best choice is to get the CFL-type of light bulb since it uses lesser power but generates brighter light. Quality: It is important to look at the materials that the stand and diffuser are made of. Softbox light with high quality can ensure its long lifespan. Light stand should be made of aluminum alloy because it is light but strong while the diffuser should be made of nylon fabric to achieve maximum light reflection.